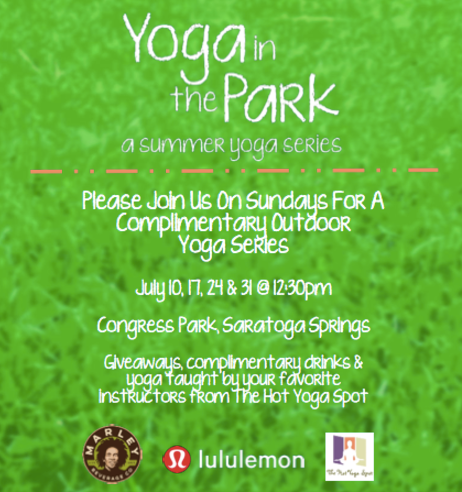 Join some of your favorite instructors from The Hot Yoga Spot Saratoga, along with Lululemon and Marley Beverage Co. for summer yoga in the park. We are teaming up to bring you a series of fun afternoons that will be hosted at Congress Park in Saratoga Springs from 12-2 on Sunday July 10, 17, 24 and 31. The Hot Yoga Spot will be leading a free yoga class each Sunday from 12:30-1:30. Arrive at 12:00 to enjoy a lulu lemon trunk show with giveaways and free beverages and swag provided by Marley Beverage Co. Everyone is welcome to attend this event, so bring family and friends and enjoy some fun in the sun!